What is more American than ethanol? It’s grown, manufactured and consumed in this great nation creating jobs, tax revenues, reducing greenhouse gas emissions and lessening our dependence on foreign oil. Its co-product feeds our cattle, hogs, poultry and aquaculture. 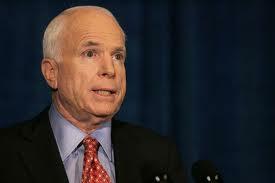 But some people just don’t get it and one of those people include Sen. John McCain. This week, United States Senator, John McCain (R-AZ) introduced an amendment to stop USDA programs from funding ethanol blender pumps. This is not Sen. McCain’s first attempt at this measure and certainly not his only his anti-ethanol effort. The amendment was later pulled Wednesday night. The McCain camp says it’s time for ethanol to stand on its own, but the very same could be said for the oil industry who is still subsidized more than ten times that of ethanol. Some groups including the Renewable Fuels Association called this amendment a “jobs bill” for OPEC and it’s hard to disagree with that. To top it off, McCain has received some very handsome contributions from BIG OIL as well. The investment and installation of blender pumps in the United States will continue to offer more and more consumers a choice when it comes to fueling their vehicles, a choice between dirty foreign oil and clean, American-made ethanol. Our country has created a 90% gasoline mandate which heavily relies on foreign oil. That dangerous addition to foreign energy cost’s our country more than $300 billion each year and comes from countries which despise American freedoms and values. If our country is ever going to shake that addition, we will need more blender pumps, more flex fuel vehicles and an open fuel market creating equal opportunity for all energy options. Free markets are the American way and will allow for next generation biofuels to become a reality. Biofuels like ethanol have come a long ways in the past ten years by creating infrastructure and jobs, but this attempt by McCain would have blocked the additional sale and distribution of our countries only readily available alternative to gasoline halting that progress, which is simply un-American. This entry was posted in News and tagged biofuels, blender pumps, corn, ethanol, renewable fuels, Senator John McCain, South Dakota.